The Old Foodie: The Fourteenth Guest. Lieut.-Col. Nathanial Newnham-Davis was probably one of England’s first restaurant reviewers. If he were alive today he would no doubt be blogging his experiences, but in the late nineteenth century his only options were to write for newspapers, or publish a book. He did both. His articles frequently appeared in The Times, and he published books called The gourmet's guide to London, and The Gourmet's Guide to Europe. On this day in 1899, he received a dinner invitation ‘with a tinge of mystery’. He was to dine ‘at one of the cheapest but most amusing places in town’, at a venue for which an introduction was required, where the conversation would be in French, and he was sworn to secrecy as to its whereabouts. It doesn’t sound like a commercially viable idea for a restaurant, does it? After walking through a labyrinth of streets in an unpretentious locality, they entered (via a wine-shop) what was clearly a private apartment, presided over by “Madame” (there is no suggestion that she was A Madam however, in spite of the secretive nature of the evening). The meal began with a soup and continued with the boiled beef, whereupon “the lady in green” (unlucky colour, that) “made the terrible discovery that we were thirteen at table”. Madame was prevailed upon to sit down (she had been “hovering” and superintending the food, it seems) until a couple of belated guests arrived and saved the night. An admirable chicken, a sweet and cheese and coffee completed the meal for a total cost of two shillings. Thirteen has been an unlucky number in many cultures for many centuries, and all sorts of explanations are given for the superstition, which I wont go into here. Suffice it to say that thirteen at table is a particular worry, the belief being that one of the guests will die within the year. The point was proved to some when President Wilson died within a year of giving an Armistice dinner for thirteen. 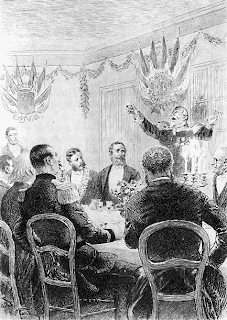 The belief was (still is, they say) particularly prevalent in Paris, where independent gentlemen made themselves available as paid guests, called quatorizième (“fourteenth”) ready at a moment’s notice to save the life of someone else at table, in the unfortunate event that only thirteen others turned up. The number thirteen pops up with varying significance in many places. In Norfolk it is (or was) believed that primroses are unlucky, but if one must bring them into the house, the bunch must not be fewer than thirteen in number, or broody hens (or geese) will hatch only the same number of eggs from the clutch as the number of primroses. As an accompanying belief, the traditional number of eggs to set under a hen is 13 – in the belief that she will then rear 12 and the 13th will be addled. I therefore give you a recipe for a sixteenth century tart of eggs and primroses, and your guests will be very lucky if you go to the trouble of making it for them. The recipe is given as a variation of a tart of borage flowers. To make a tarte of borage floures. of three or foure egges, and swete curdes, or els take three or foure apples, and perboyle wythal and strayne them with swete butter and a lyttle mace and so bake it. To make a tarte of marigoldes primroses or couslips. Take the same stuffe to euery of theim that you do to the tarte of borage and the same ceasonyng. Hello Stacy - I use Gutenberg books all the time - including the Gourmet's guide. It is great to find a real person behind one of those wonderful gutenberg books. Thankyou Thankyou Thankyou.